"You're on the right track with Fast Trak... bringing you safe & secure to your destination." 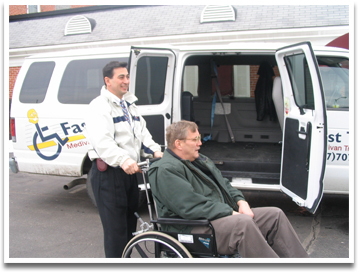 Fast Trak Medivan Transport is a Non-Emergency transportation with wheelchair accessibility. Fast Trak Medivan Transport is State certified and has CPR trained drivers. Drivers are professionally dressed, courteous, polite & friendly! Contact us within 24-48 hrs. prior to your appointment at 847-707-4137. We are available 24 hrs. a day; 6 days a week. Download a Fax Form Here. Please call first to confirm if time is available before faxing.